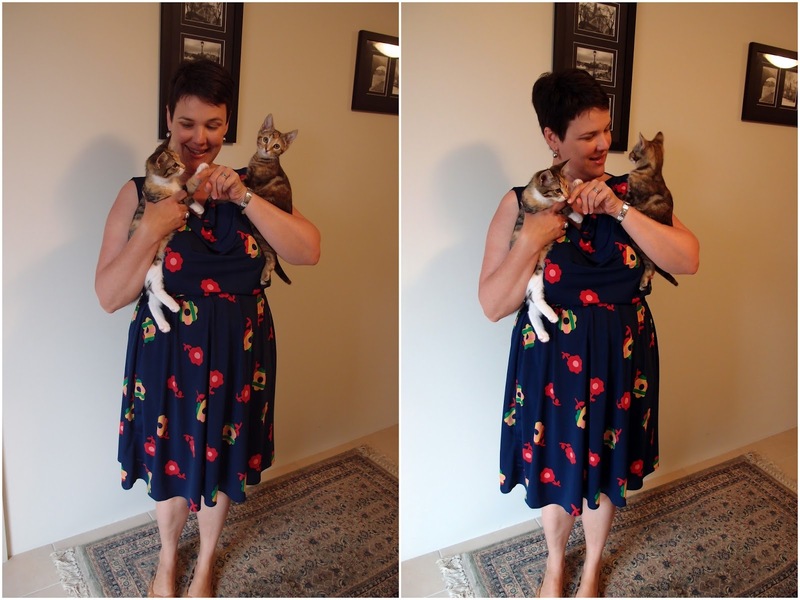 Oh look, it's ANOTHER Myrtle dress...this time with armholes that fit; and accessoried by the foster kittens we are currently minding at Chez Melanie. Because you've seen this dress, and this Spotlight fabric before, I thought it'd be nice to introduce you to Socks (with the white feet) and T.O.O (called The Other One as we couldn't think of a name for her). Dave and I have been fostering kittens for the Cat Protection Society in Enmore for about two years now. We host a few litters each year who live in our study for a few weeks at a time (which they have totally destroyed - the couch is shredded, and the books on the bottom shelf are chewed, cables are gnawed upon and the carpet well and truly christened with pee and poop). People wonder how we can give them back...with all that destruction it's pretty easy actually. The kittens come to us at about 7 weeks old and stay until they are 1kg. At the 1kg stage they go off to be desexed and then back to Cat Protection where they await their "furever" home. These kittens are well over the 1kg mark but we're keeping them until the New Year as the shelter is currently full. You can see though they are still pretty light; and I can easily lift Socks with one hand...demonstrating how perfect the depth of the armhole is now. After lowering it by 2cm on my last few versions; I raised it back up by 1cm and cut the armhole as a L whilst keeping the rest of the dress as an XL. 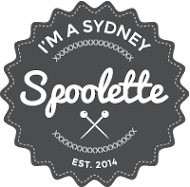 The dress is SO comfortable now...I wore it out shopping in Chatswood today and in the car as I drove there...comfy comfy comfy. After the back neckline of my purple Myrtle stretched out to make it unwearable I stay stitched the heck out of the back neckline and back armholes of this bodice (and used tearaway too just to be doubly safe). 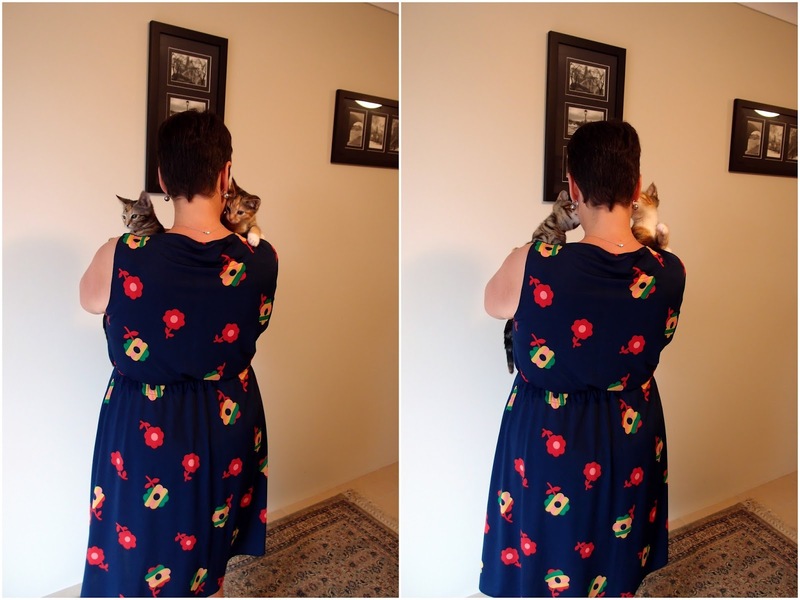 The back neckline looks a bit stretched/bunchy, but it's just my kitten wrangling making it bunch up. That said, the back bodice is a tad wide though so if I knew how I could pinch out some fabric here...but I've had enough of fiddling with this dress. I just wear the top pull across in a faux "off the shoulder" kinda of way which makes the back fit perfectly. Oooh, this is Flash (who I call Sad Panda as she just looks so glum all the time). She is melded to this cat bed so the best way to get some Sad Panda time is just to pick her up...bed and all! Back to the dress: I'm still having a bit of trouble figuring out the elastic waist for this dress (and anything that requires elastic). I *think* this could be a smidgen tighter, but I'm not 100% sure. I also thought I should perhaps lengthen the bodice a bit to make it more blousey and to hide the elastic waist a bit...I don't know? What do you think? And just a safety note for those of you who like to sew with cats around. Thread is VERY dangerous to cats...they eat it and it gets wrapped up in the guts/intestines. This can actually result in death (and a lot of pain too) and costly operations if you choose to go there. So the motto is...cats and sewing don't really mix. Modifications: Armholes changed to Size L; and then lowered at the arm pit by 1cm. Fabric: Polyester Elastaine from Spotlight (the same print I made my very first, too small, Myrtle out of). Notions: Elastic, thread and kittens. Changes for next time: None, though I'd like to try it in a "not" polyester elastaine. I'm so happy that you finally got the armholes to a point where you like them and that the dress works! hopefully you can find a beautiful knit to give it another whirl in after you've made some other pieces? If I fostered kittens I would own ALL the kittens as I could not hand them back again. I am so pleased you have a comfortable, wearable dress. It looks great on, very Leona Edmiston (in a good way) - gee I wish I could get my hands on her fabrics! Well done for persevering with the pattern, it certainly has paid off. I love your kittens, just adorable, I am sure I would be the same as Susan and wanting to keep them too, then again you make such a good point about the destruction! 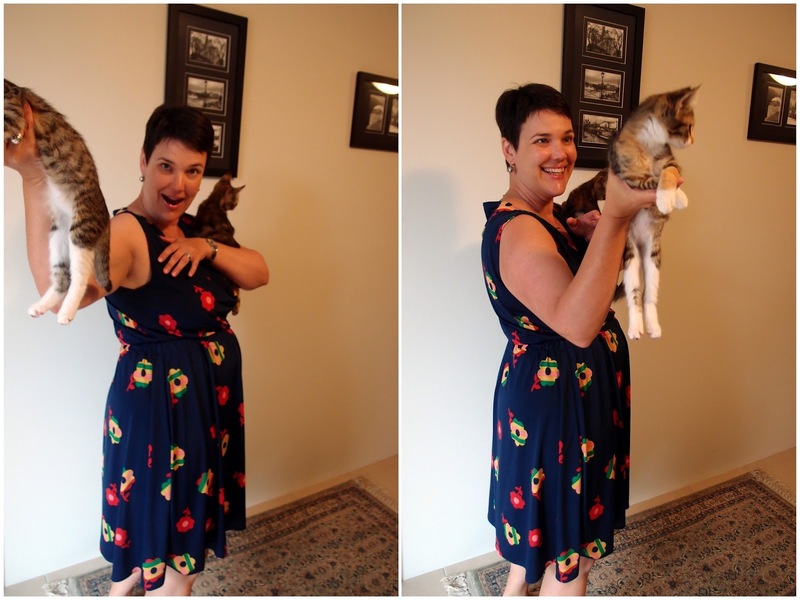 cats and comfy dresses! yay for both. Also a great way to demonstrate your different modelling poses. i must get myself more cats!